The success of any venture is largely dependent on having the right information. When the project has to do with real estate, having the right information means having a real estate market analysis. Once you’re armed with the right intel, you can confidently proceed with buying or selling, knowing you’re making informed decisions. The right real estate market analysis can provide valuable insight into local and regional opportunities and threats. Provided with both quantitative and qualitative data, someone with expertise can determine a great many things about the market. 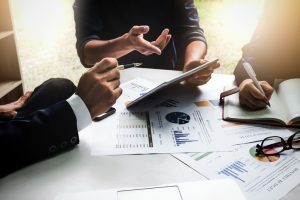 The data can be used to make recommendations regarding market conditions, the competitive landscape, and the best practices for marketing and sales. Taking the time to gather the requisite data allows you to fully understand the property’s market area so that you can determine whether it’s a profitable investment. There are many different ways to gather this data, but by far the most effective way is to hire a team with on-the-ground experience, with the right tools and proprietary data to uncover valuable trends in pricing, inventory, and buyer preferences. Analytics, including customized market reports, comprehensive pricing models, pipeline summaries, and ongoing buyer profiles empower you to successfully navigate the market. Why do you need a real estate market analysis? Because every successful real estate marketing strategy begins with the right information, which gives you the ability to make a comprehensive plan. Well-informed, you can develop innovative marketing strategies to promote your business. A successful real estate marketing strategy requires information, insight, and the experience to make it all come together. SagePoint understands the ins and outs of urban and resort real estate development marketing and sales, and our experience keeps you at the forefront of the industry, with the professional marketing, sales and advisory services you need to stay on top. When we’re part of your project from the very start, you can expect your property to be positioned, designed and built to target your market and maximize your returns. To learn more about our services, please contact us online or email us at inquiries@sagepointre.com.